Perhaps you are overworked, overwhelmed, over-worried, overtired, over-everythinged. Maybe you feel like you were born to run... to your child's numerous therapy sessions. Maybe you aren't so young anymore. Maybe you never had a wife and kids in Baltimore. And your name isn't Rosalita. Maybe you regularly feel like you are going down, down, down. And then you go to a Springsteen concert on a rainy Saturday night. There's a delay, because it's outdoors and there's lightning in the area. But when it starts, you are sucked right in. It's the eve of Bruce's 63rd birthday and the man is as full of life on stage as he ever was, for four hours straight. This one's for you, friends. Show a little faith—there's still magic in the night. O.k. Now I officially love you. Yes I'm a 'special needs mom' and yes I'm a "Bruce' groupie. Have been all my life. Thanks for this fab post! You know, when I was 15, living in Japan, "Born in the USA' was huge (shows how old I am, huh). I didn't like it. Then when I was in TOkyo, my host father bought me a ticket to the Human Rights concert that was playing then - which included Tracy CHapman and Peter Gabriel, whom I loved. 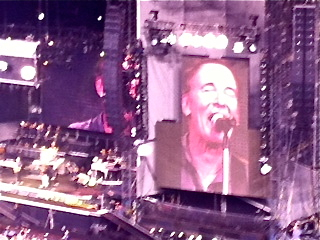 What I found though was that Bruce Springsteen - also a part of the concert - BLEW EVERYTHING AWAY. He was amazing. Talk about charisma! Power! He had over 10,000 people, including me, dancing and pumped. And my host mother, who went with me - and there is NOTHING - nothing!!! - like seeing a stiff middle-aged Japanese housewife pumped on Bruce!!!! Ellen, "Hey, you're all right". Fun post. Wasn't it a great concert? I loved it - I found myself wishing we were watching the concert in the rain, not worrying about hair or makeup or being a mess - instead of clustering outside the bathroom. Nothing like gobbling down a hoagie in the parking lot at 2:30AM!